Delicious fluffy low carb cupcakes with strawberries topped with a strawberry mascarpone frosting. 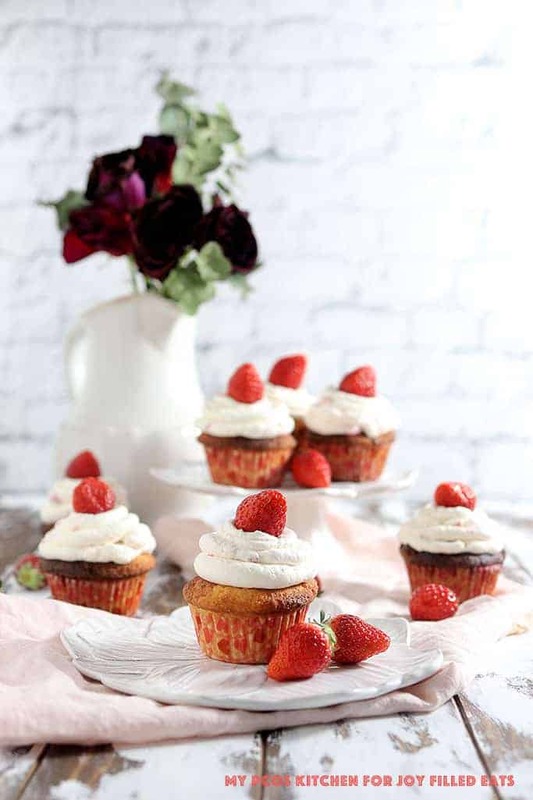 These strawberry cupcakes are gluten free, sugar free and freezer friendly! Hey everyone! It’s Mira again from My PCOS Kitchen. I’m here to show you how to make the ultimate low carb strawberry cupcakes today. This is a recipe I’ve been working on for the last couple of weeks because it’s strawberry season in Japan! 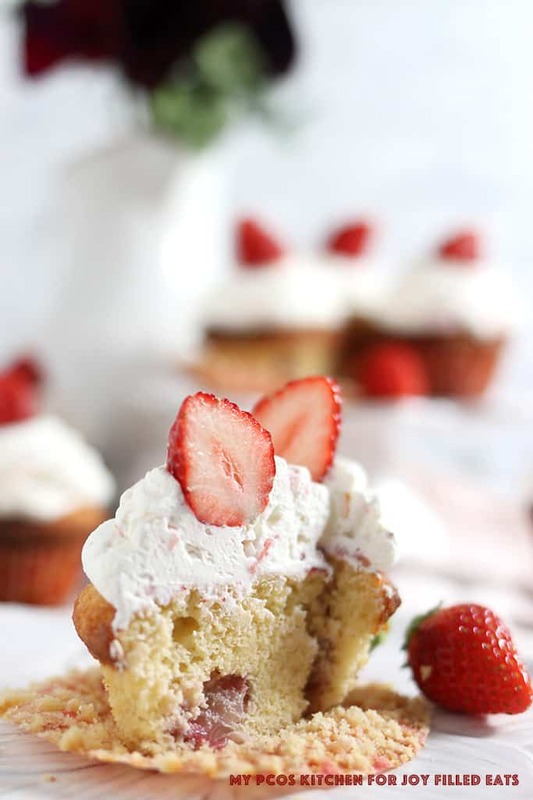 These low carb cupcakes have fresh strawberries inside the batter and inside the mascarpone frosting! They’re extremely soft, crumbly and sweet just like normal cupcakes! No one at work knew these were sugar free, and they were gone in an instant! I’m seriously so proud of these low carb cupcakes. They’re so good and sweet, it’s hard to stop yourself from eating them all! I had to put half of them in the freezer because I would’ve eaten them all in one sitting. These low carb cupcakes are made with a sour cream vanilla cupcake recipe base. The cool thing about them is that the cupcakes can totally be dairy free by switching the sour cream with coconut cream. They’re based on my dairy free biscuits recipe that I turned sweet by adding some sweetener and fruit. This low carb cupcake batter is awesome because it can be used to make any kind of baked sweets! Think low carb muffins, donuts, cakes, and so on! The possibilities are endless. Mascarpone frosting is a type of cheese frosting that can be used to top any kind of baked dessert or fresh fruit. It’s very similar to a sugar free cream cheese frosting, but instead of cream cheese, it uses mascarpone. It’s a combination of mascarpone cheese and heavy cream that’s whipped up beautifully. It’s sweetened with a combination of powdered erythritol and stevia powder. This strawberry mascarpone frosting has added chopped fresh strawberries to give it that nice fruity and sweet taste without all of the sugar. For the mascarpone frosting recipe, it’s really important that you used powdered erythritol as you don’t want your frosting to be grainy. Simply add granulated erythritol to a blender and blitz for about 30 seconds. You’ll then have yourself some homemade powdered erythritol! Can I Use this Mascarpone Frosting on Other Cupcake Recipes? Of course! We have so many cupcake recipes on both blogs so you’ll definitely have lots of options to make! Sugar Free Carrot Cake – You can make these in cupcake form! The first thing you’ll want to do is mix all of your wet ingredients together. Make sure you use room temperature mascarpone and butter or else it’ll be really hard to mix and the butter will be too chunky for the cupcake batter. First, you’ll cream the butter and mascarpone. Then you’ll add the eggs, vanilla and lemon juice. You’ll then mix everything until a nice pourable liquid forms. There shouldn’t be any butter or cheese bumps in this batter. After that, you’ll want to mix all of your dry ingredients into a large bowl. This is important so that all of the sweeteners and baking ingredients get evenly distributed. Once your dry ingredients are mixed, you’ll pour in the wet ingredients and mix evenly. In a separate small bowl, you’ll mix the chopped strawberries with a little bit of coconut flour. This helps them do two things. One, it helps the berries not sink at the bottom of the cupcakes. Two, it helps the cupcake batter not become too wet. 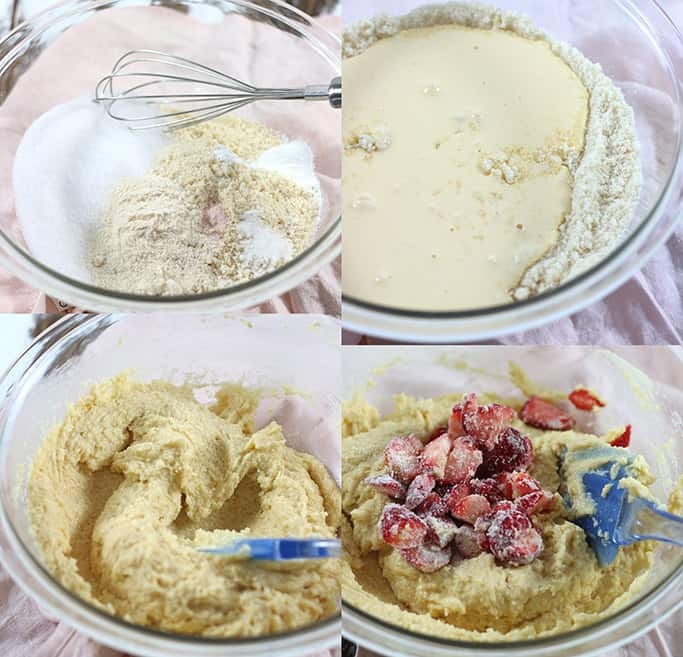 Mix the strawberries with the batter and you’ll get a spoonable batter. This low carb cupcake batter is not liquid! It should be spoonable and somewhat thick. Evenly distribute the strawberry cupcake batter into 9 muffin cups lined in a muffin pan. I don’t recommend adding the batter directly to the muffin pan because this batter tends to stick a lot to metal. Please make sure to use muffin cups for this recipe. 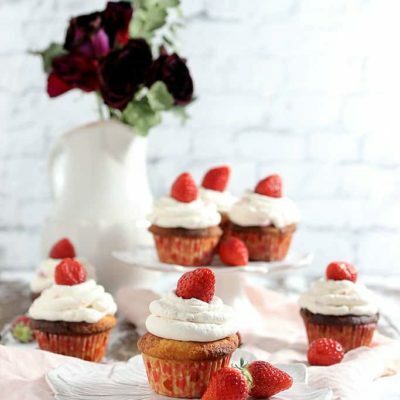 Place the strawberry cupcakes into the preheated oven and bake for 30 minutes. Once they’re done, let them completely cool before adding the frosting over them. You don’t want to have a melted frosting mess on your hands! For the mascarpone frosting, you’ll want to cream your mascarpone with the erythritol and stevia powder. Once that’s nicely creamed, you’ll slowly add the heavy whipping cream and whip it for a good 3-4 minutes. Make sure your heavy whipping cream is very cold or else it won’t whip. Once the mascarpone frosting recipe is whipped, you can add the chopped strawberries and mix evenly. 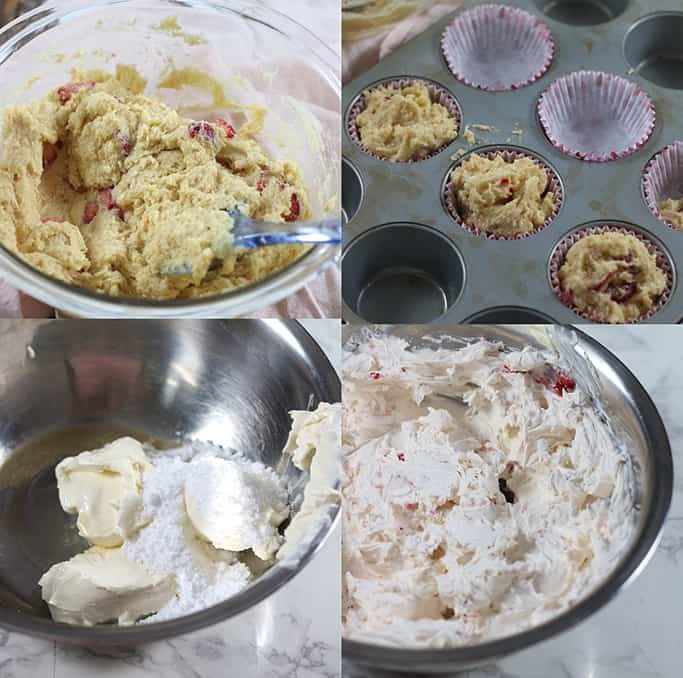 The last step is to transfer the frosting into a piping bag attached with a large round tip and frost an appropriate amount of frosting all over the strawberry cupcakes. 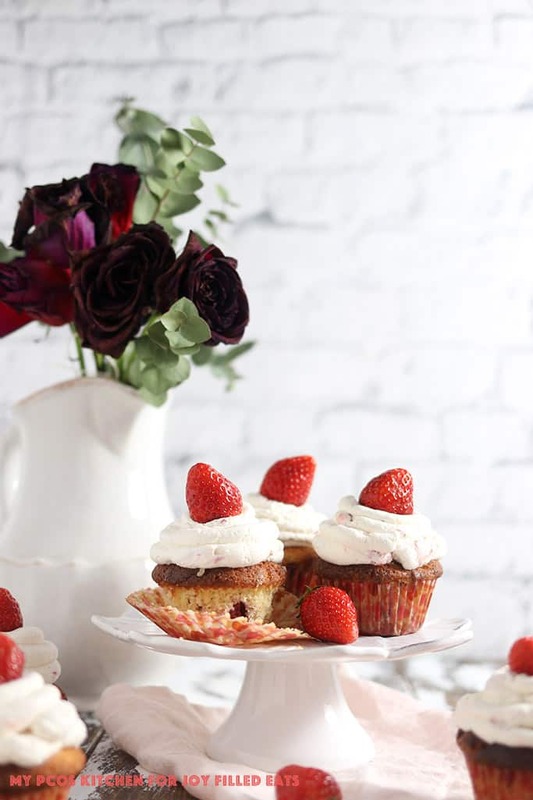 Place one fresh strawberry over the mascarpone frosting recipe and your fresh strawberry cupcakes are ready to be served! 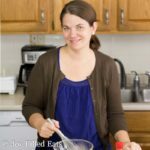 What sweeteners can I use for Low Carb Cupcakes? I’ve tested this low carb cupcake recipe with three different sweetener combination to see what would work. My favourite were the erythritol and stevia blend but here are a couple more options you can use. I tend to bake all of my recipes with the above three sweeteners as they’re my favourite go-to sweeteners. 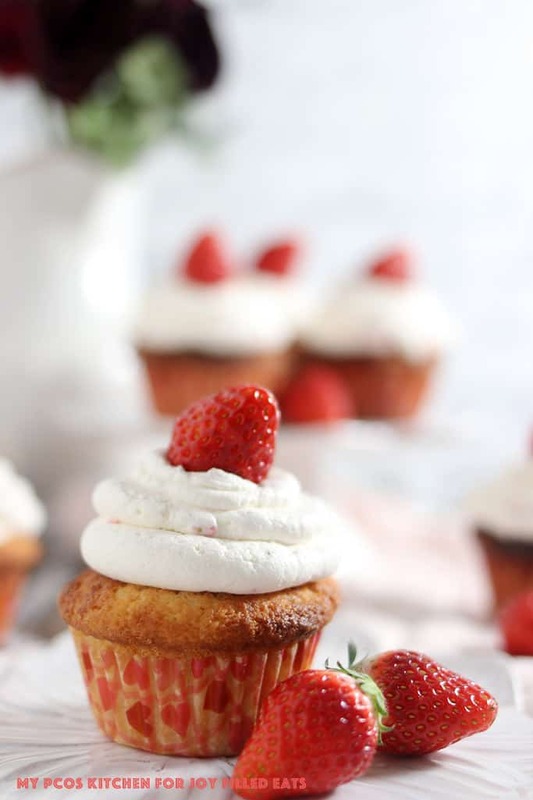 If you want to make paleo strawberry cupcakes, then you would simply replace the 1/2 cup of low carb sweetener for 1/2 cup of maple sugar or coconut sugar. Can these strawberry cupcakes be frozen? Yes! These low carb cupcake scan be frozen with the mascarpone frosting and fresh strawberries on top. Simply wrap them in saran wrap and freeze each cupcake. When ready to serve, you can just leave them in the fridge to thaw naturally, or microwave for 1-2 minutes until soft. Of course! Actually, any type of berries or fruit will work for this recipe. Fresh or frozen both work. Just remember to coat the chopped fruits with coconut flour beforehand as the wetness from the fruits can make the cupcake batter too wet. Here are some common substitutions you can use when making these low carb cupcakes. Instead of strawberries, you can use any type of berry or fruit you want. Just remember the carb count will go up or down depending on the fruit. Instead of almond flour, you can use any other type of nut flours. Instead of erythritol and stevia, you can use 1/2 cup of Lakanto Golden or 1/2 cup of Sukrin. Instead of butter for the cupcakes, you can use coconut oil, avocado oil or lard. Instead of lemon juice, you can use white vinegar or apple cider vinegar. Instead of sour cream, you can use coconut cream to make the cupcakes dairy free. Instead of mascarpone for the frosting, you can use cream cheese. Instead of stevia, you can use monk fruit powder extract in equal amounts. Follow the following tips and recap to make sure your low carb cupcakes turn out absolutely perfect! Make sure to use room temperature butter for the batter as it will be very hard to mix if it’s hard. Make sure to use muffin cups as the batter tends to stick to metal moulds. Check the middle of the cupcakes after 30 minutes with a toothpick. If it’s still wet, bake for another 5 minutes. Don’t over beat the mascarpone and whipping cream or you’ll make some butter by accident. Make sure to use cold heavy whipping cream or your frosting won’t whip up. Soft and fluffy low carb cupcakes filled with chopped strawberries and topped with a mascarpone frosting! In a large bowl, combine the dry ingredients and mix together. In an another large bowl, combine the wet ingredients and mix together. In a small bowl, combine the chopped strawberries for filling with the 1 tsp of coconut flour. Mix together. This will help the batter not get too wet from the strawberries. Pour the wet ingredients into the dry ingredients and mix well. Add the chopped strawberries and mix again. Spoon the cupcake mixture into 9 muffin cups in a muffin pan. Please use muffin cups as the batter tends to stick to metal molds. Transfer the muffin pan into the oven and bake for 30 minutes. Take the cupcakes out of the oven and let completely cool. Add the mascarpone to a medium bowl. With a hand mixer, mix until it's nice and smooth. Add the erythritol, vanilla, and stevia and mix to combine. Slowly pour in the heavy cream, a little at a time, until it's all added. Mix for 3-4 minutes. The frosting will get thicker as time goes by. Don't over whip or you'll make butter. Add the chopped strawberries into the frosting and mix well. Transfer the frosting to a piping bag attached with a round tip (tips other than round tips won't work because of the strawberries). Once the cupcakes have cooled, pipe the frosting over and top with one whole strawberry each. The cupcakes are ready to eat. These can be easily frozen. Just wrap them in saran wrap before and place them in a ziploc bag. When ready to eat, just thaw them in the fridge overnight. Make sure to use room temperature butter for the batter as it will be very hard to mix if it's hard. Check the middle of the cupcakes after 30 minutes with a toothpick. If it's still wet, bake for another 5 minutes. 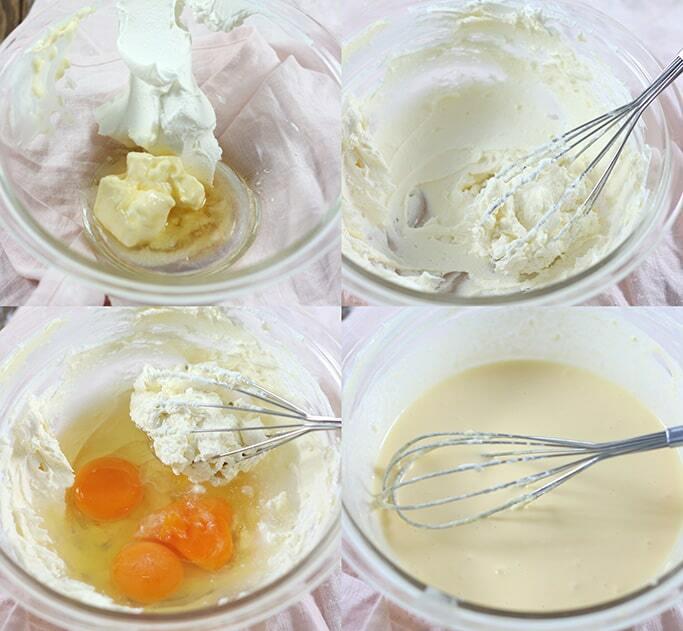 Don't over beat the mascarpone and whipping cream or you'll make some butter by accident. Make sure to use cold heavy whipping cream or your frosting won't whip up. Is there butter in the frosting? Instructions say butter and marscapone. Thanks!! No butter. I will edit the post! Could I replace the flours with THM baking blend? How much would I use? I have not tested baking blend in these. If you try it use a little less. This low carb treat was exactly what I needed today! These cupcakes have the perfect spring flavor! Could these be any more dreamy?! Totally loving these keto cupcakes!